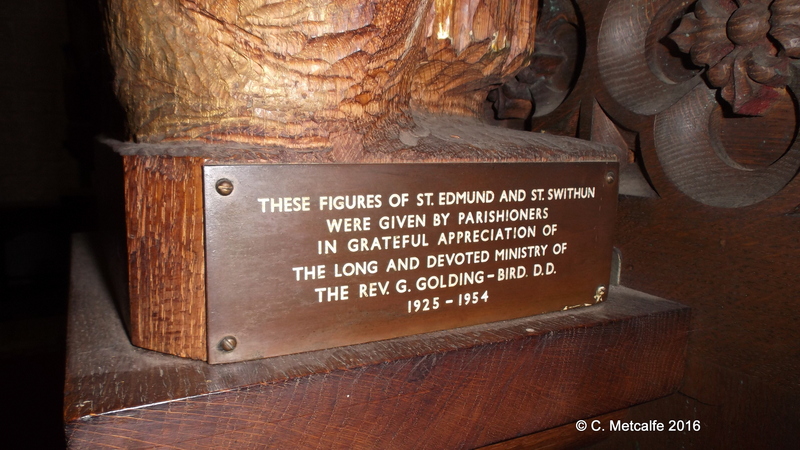 In St Swithun’s church, the carved oak Reredos (basically this means back screen) and Altar were given by the late Rev’d C. Leslie Norris as a memorial to his wife. The work was carried out by Mr Laverty of Winchester in 1928. AD DEI GLORIAM ET IN CARISSIMAM MEMORIAM JEANIE NORRIS QUI EX HAC VITA AD DOMINUM MIGRAVIT AD VII KAL. AUG. AD MCMXXVI DD C.L.N. (To the Glory of God and in dearest memory of Jeanie Norris who departed from this life to the Lord on 7th August 1926). The initials are those of her husband, who was probably a Doctor of Divinity. He is not listed on the board in the Church Porch as a Vicar of St Swithun’s church. He may have been a curate, or a retired clergyman who came to live here. The East Window was already in place. It was given by Elizabeth Clarke of Frampost and was the work of Hardman in 1879. The central subject is the Crucifixion. The figures of the 2 saints, St Edmund and St Swithun, were added to the reredos screen later. 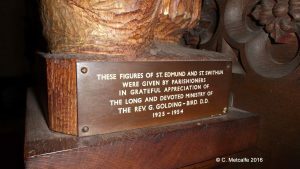 They were given by parishioners ‘in appreciation of the long and devoted ministry of the Rev’d G. Golding-Bird 1924-1954’. The statues are the work of Miss Elizabeth Demster of Edinburgh. It is thought that the church was once dedicated to St Edmund. He was an Anglo-Saxon King, and an early Christian. He was brutally killed with arrows. By tradition, he had a tame wolf, which is shown with him. The church has been dedicated to St Swithun for hundreds of years. St Swithun, Bishop of Winchester died in 862 AD. He was at first buried outside the cathedral, as he wished, but later, his remains were brought in. Terrible weather followed, so St Swithun is associated with the weather. If it rains on July 15th, St Swithun’s Day, there will probably be rain for the next 40 days. Because of his association with rain, he is shown with ducks at his feet. The font cover was bought by parishioners in 1928, the same year as this Reredos and Altar were made, so parishioners and clergy were apparently decorating their church at this time, some 10 years after the Great War ended. 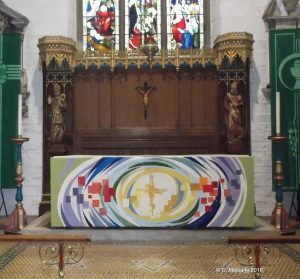 It is likely that the Font, Altar and Reredos were intended to complement each other.